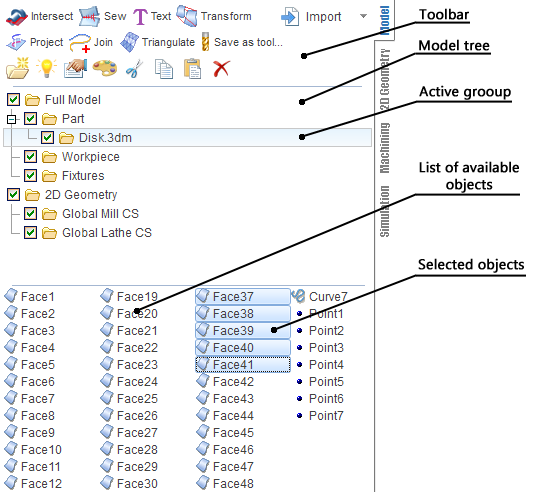 The model structure window consists of three panels: the <tools panel>, the <model tree> and a <list of available objects>. In the <model tree> panel above, the structure of the whole model is displayed. Three nodes make up the groups of the model, which are located at different levels. The active groups are highlighted. When selecting an inactive group using the mouse or keyboard, the group becomes active and the list of available objects changes accordingly. In the <list of available objects>, all groups and geometrical objects, which are a part of the active group, are displayed. That is, the objects which are currently available for selection and modification. Single left mouse clicking on any of the listed objects, selects that object. Double clicking on the group in the list of available objects, the selected group becomes active, and the list of available objects changes accordingly. – New folder creation. The folder will be created inside the active one. – Set selected surfaces visible/invisible. – Viewing and editing properties of selected objects. – Setting colour of selected objects. – Works with the exchange buffer (cut, copy, paste). The cut/copy function works with the highlighted objects. Insertion from the exchange buffer (paste) is performed into the active group. – Getting curves as section of 3D model by plane. – Spatial transformations of selected objects. – Outer borders projection on plane. – Save selected contour as form tool.